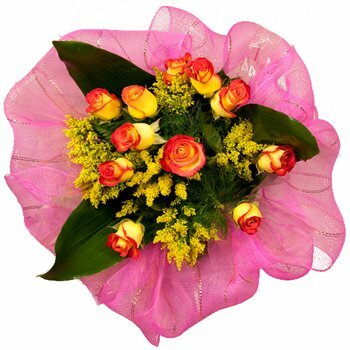 Celebrate happiness with this cheerful arrangement. A luscious collection of stunning yellow roses with hints of bright orange are peeking out of a cloud of sunny wildflowers, surrounded by dramatic foliage, and set against a backdrop of whimsical pink. Ideal for housewarmings, for colleagues and staff, or even as a romantic offering, the Sunny Days Bouquet will warm your recipient's heart.